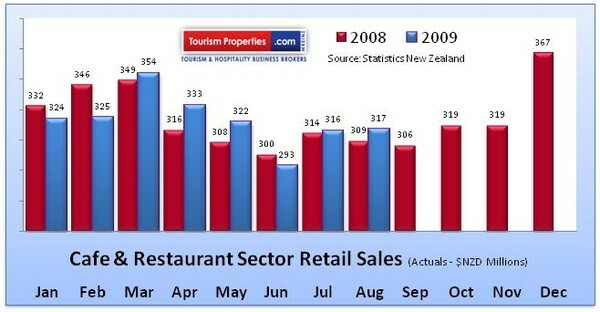 Based on figures released today by Statistics New Zealand, actual retail sales in the Cafe and Restaurant Sector were at $317 milion for the month of August. This is $8 million or 2.6% improvement in sales when compared to the same period last year. On a year-to-date basis the retail sales in this sector are 0.4% (or $10 million) ahead of the same time last year. While this is not a significant amount the trend for the last two months has been positive. According to Tourism Properties, New Zealands specialist Hospitality Business Brokers, there is a growing positive sentiment from Hospitality Business Owners. For many the last 12 months have been tough and simply trading at a consistent level has been challenging. General positive news on the economy, and the prospect of seasonally stronger trading during the summer, should see the improved trading in the Cafe and Restaurant sector continue.